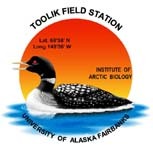 Toolik Field Station provides a GIS (Geographical Information Systems) and Remote Sensing (RS) Program as part of the 5 year Cooperative Agreement between the National Science Foundation and the Institute of Arctic Biology, UAF in 2001 (NSF Award No. 9981914). The mission of this Program is to facilitate and enhance arctic research, and to increase research and management efficiency, effectiveness and capability. This is accomplished: 1) through Information Technology (IT) and GIS-RS support of administrative and management infrastructure and production of planning tools for land management and permitting, and 2) through direct consultation and GIS, RS, and GPS support services to scientists. ToolikGIS provides a rich spatial geodatabase, project-specific data development, spatial analyses, consultation and documentation. These services are available at the station during the summer field season and through the ToolikGIS office at UAF year round. 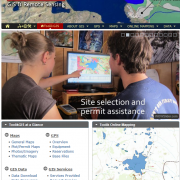 A standard suite of GIS services include: assisting researchers with site-selection requests, recording the location of new sampling sites, collecting survey-grade data, producing customized maps, and providing comprehensive project support and analysis.